This year DEVI celebrates their 75th anniversary. Since the beginning in Copenhagen in 1942, DEVI has established themselves as Europe’s leading electrical heating brand within the industry. 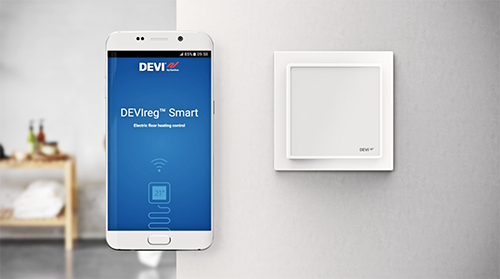 The DEVIreg™ Smart with DEVIsmart™ App provides optimum floor heating comfort, exactly when and where you need it. Electric floor heating regulation has never been easier. There are a lot of myths about floor heating; some of them concern daily usage. Let’s dispel some common myths about electrical heating. DEVI offers a smart and simple solution to keep our houses dry and safe during the winter season. Outdoor heating systems help to save time and money while avoiding unnecessary work. DEVI ice and snow melting systems are fitted to meet homeowners individual needs. Considering the ease of DEVI installation, we are glad to support each electrical heating installer with specific online training, tailored to particular demands. The DEVI e-learning program covers certain product know-how as well as tips and tricks for their installation. Are you a home owner? Find more about DEVI products and how can they improve your home. We wish you a very Happy Holiday season and a happy, peaceful New Year!